Ska fans beware. The Supertones are here, and the party has started without you. Even though ska has had a devoted following, on and off, in England and in California since the late 70's, it's taken this long for a Christian band to take a shot at it. Better late than never. If you're not familiar with ska, picture post-punk England: Lot's of energy, but the three-chord thing has run it's course. Down the street from the punk clubs the reggae scene is growing. Some clever locals combine the two and come up with ska. Imagine the one-three rhythms from guitars and a two-four beat from drums, and throw in healthy doses of brass, sax, and yelping background vocals. The result is a sort of polka-flavored punk music with woodwinds. Vocals are sung, or spoken, rhythmically, with more than a passing similarity to rap. Very few bands have had any breakthrough success with the genre, but to devotees nothing else will do. 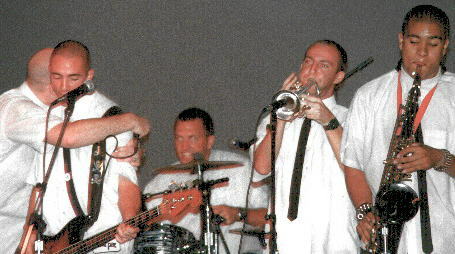 The biggest pop examples of ska's influence on the music scene have to be The Police and UB40. 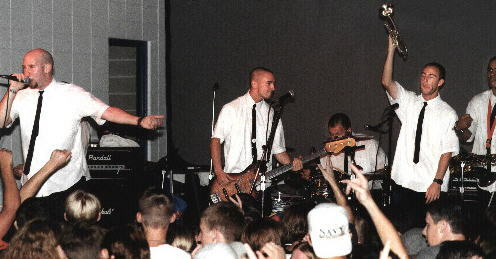 The American version has been kept alive by the college favorites Mighty Mighty Bosstones. 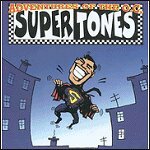 Although borrowing part of their name from the Bosstones (interesting, because boss and super can mean the same thing in certain slang contexts), The Supertones have incorporated a rougher California punk attitude into their mix than have the East Coast's Bosstones. The music on their somewhat self-titled debut is basic, straight-ahead ska, which in it's punk simplicity boarders on Oi, a sub-genre of ska. (To outsiders, the difference between ska and Oi is about as clear as the difference between death metal and thrash. But if you're into it, you know the difference.) 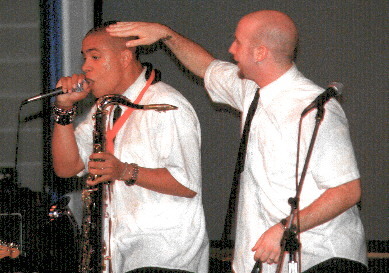 The Supertones are as bold in their presentation of Christ to their listeners as they are with their music. The lyrics to songs like Adonai and Who Can Be Against Me make their love of God as plain as the ties on their necks. In a way similar to that of The Altar Boys and PlankEye, they manage to be perfectly direct without sounding silly or trite. The Supertones haven't done anything terribly original here, but they have filled a niche that was in desperate in need of filling. They're also a really young band with a bright future. Congratulations to Tooth And Nail for being the first Christian label to recognize the viability of this genre.